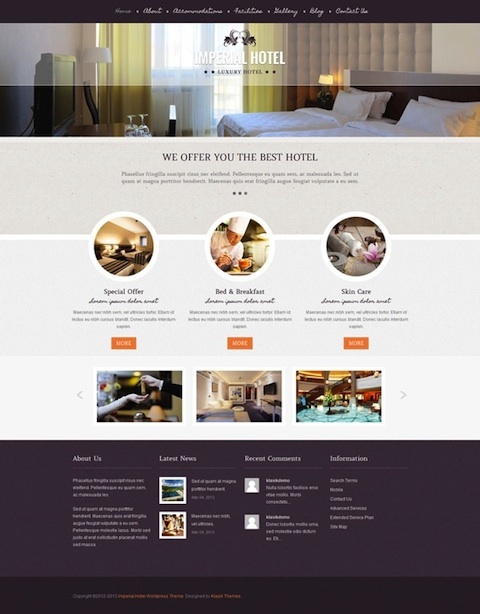 Imperial hotel is a wordpress theme designed for hotel, resort and hostel websites. Featured in the homepage area, the slider, features and image carousel. The Imperial wordpress theme framework is easy to use, simple and to the point, and it was created with best practices and well-structured coding standard. Features also include Google maps integrated, contact form, photo gallery, hotel amenities, room descriptions, room features and more.